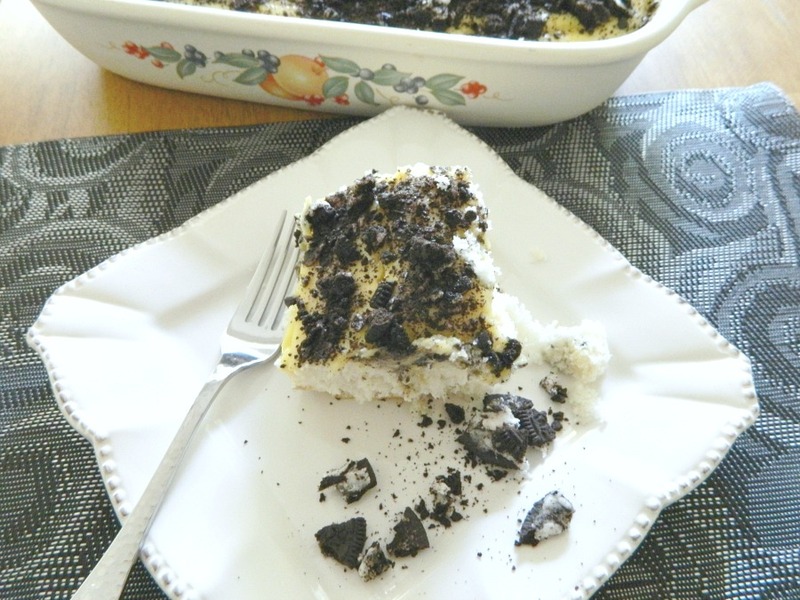 This is such a simple recipe for yummy Oreo Cookies and Cream Poke Cake. Everyone one you serve it to will adore it. Bake one up soon and enjoy every yummy bite! I made this cake on Sunday while my family was at the park and it was a real treat for them to come home and have this waiting for them. My husband and kids loved this cake and they all said it was really moist. You get a very large serving of cake from this recipe; as they say it’s “a big bang for your buck”. I love cake mixes and I think whatever you put into their mixes always turns out amazing. This cake will definitely be on my holiday dessert list. Preheat oven 350 degrees; mist a 9 x 13 baking pan with cooking spray and set aside. In a large mixing bowl, add the cake mix and baking powder; mix with a wire whisk (lighten up the mixture a little). Then add melted butter, egg whites, vanilla, and water. Using an electric mixer beat for about 2 minutes until batter is light and fluffy. Make sure you mix in all the dry ingredients that may still be on the bottom of the bowl (use a rubber spatula for this). Place in fridge for about 10 to 15 minutes. Remove from fridge, mix once or twice, and then pour into your prepared baking pan. Bake for about 25 to 30 minutes until a toothpick or wooden skewer comes out clean or with dry crumbs. Turn the pan around after 15 minutes for even baking. Try not to over bake. Let cool about 20 minutes. 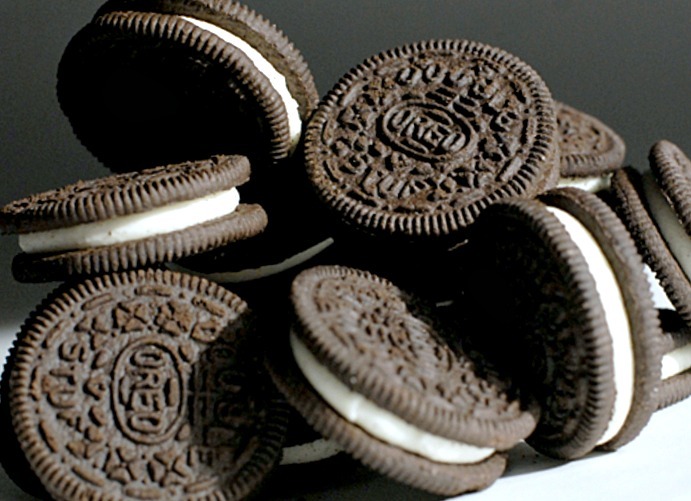 In the meantime get your frosting ready. In a medium bowl, beat the pudding mix with skim milk and 1/2 tsp of vanilla extract, until thickened. Pour into a large measuring cup and chill in fridge for 10 minutes. If you can’t fit all the pudding into the cup just keep it in the bowl and pour in two batches. Poke holes into the cake with the tip of the handle of a wooden spoon. After, pour the pudding all over the cake and spread evenly. 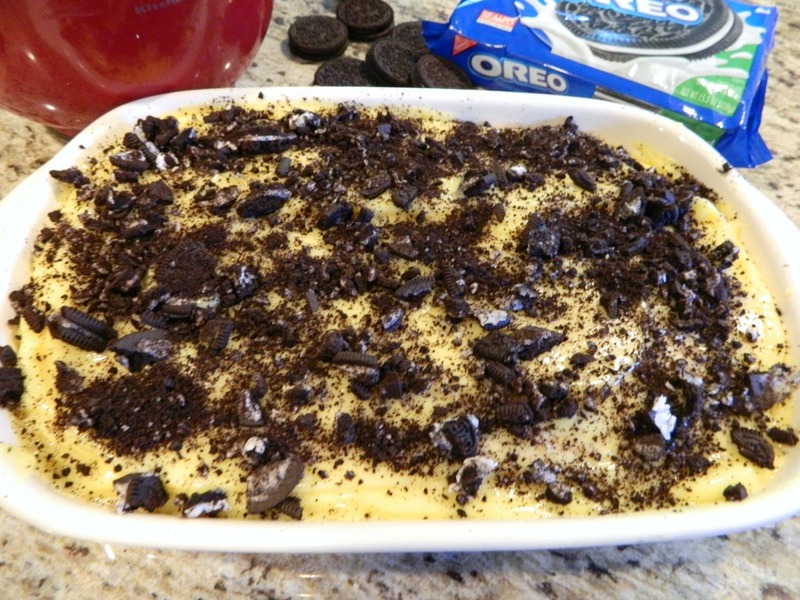 Toss the Oreos all around the topping and place back in the fridge for about an hour. Take out and slice 16 large pieces and enjoy!